Summary: This walk is best done in summer as the going underfoot can be very wet, particularly on the ridge walk from Great Coum to Gragareth. Good navigation skills are required as some paths can be hard to find. 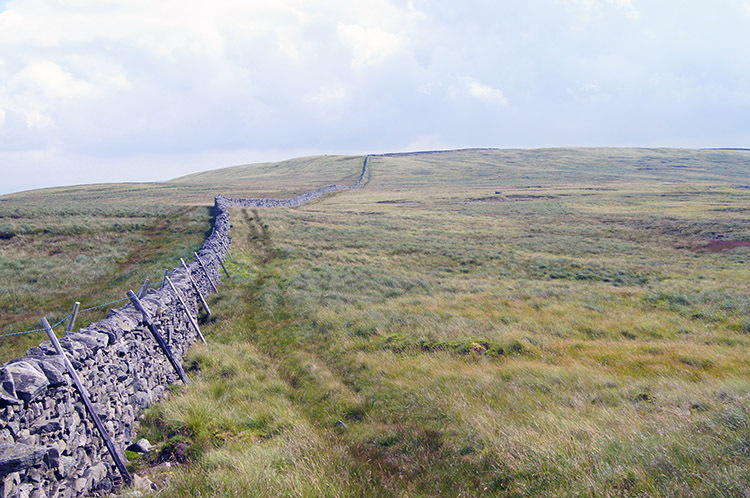 Overcome the hurdles and the walk offers fantastic rewards and be sure to go on a day of good visibility because the views to the distance are breathtaking. 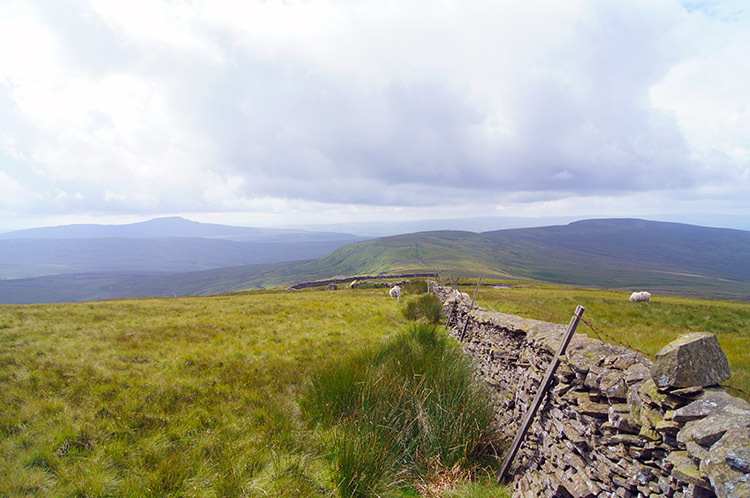 Not only can all the Yorkshire Three Peaks be seen but also the Howgill Fells, the Forest of Bowland and the eastern Lake District mountains. The Walk: I am always looking around when on a walk, surveying the scene of where I am immediately and also looking out for interesting views in the distance. In that way I am both enjoying what I have set out to do and planning for future exploration. And that is how I found Gragareth. 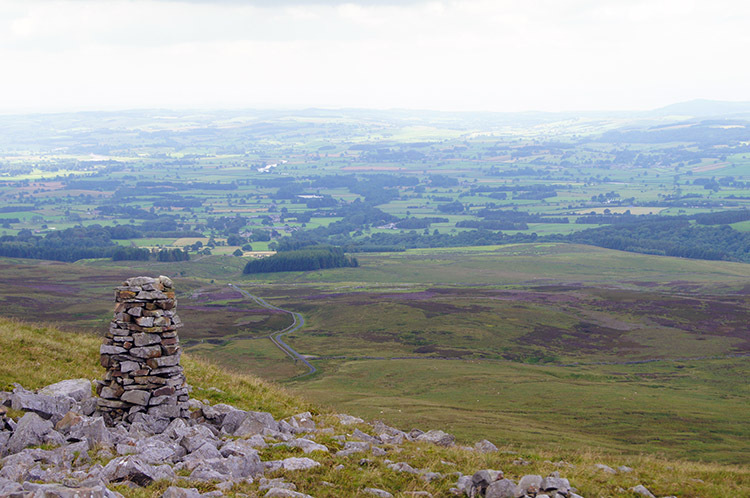 I cannot pin it down to an exact moment but I can pin it down to where I was for sometime in the past while walking on the top ridge of Whernside I looked over to the similar looking range in the west which was separated by Kingsdale and thought "I must go there one day". Since that time of imagination and discovery I had several chances to fulfil the ambition but had turned it down for other explorations closer to home but after arranging with John Lister to do a days walking in a different place I fixed Gragareth in my mind as the place to go and once and for all to fulfil the promise I made to myself on Whernside when I looked over to the mountain all that time ago. 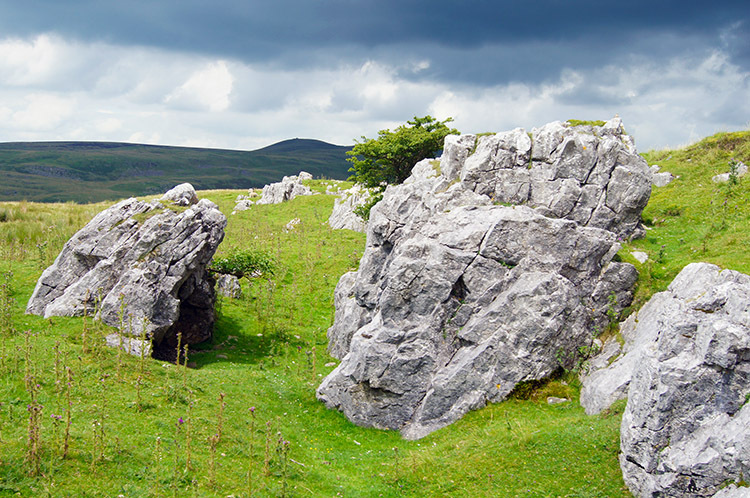 The range of Gragareth also includes two more noted hills which create a natural horseshoe walk, these being Crag Hill and Great Coum, all there hills being over 600 metres and 2,000 feet high with Great Coum the highest of the three at 687 metres (2,254 feet). 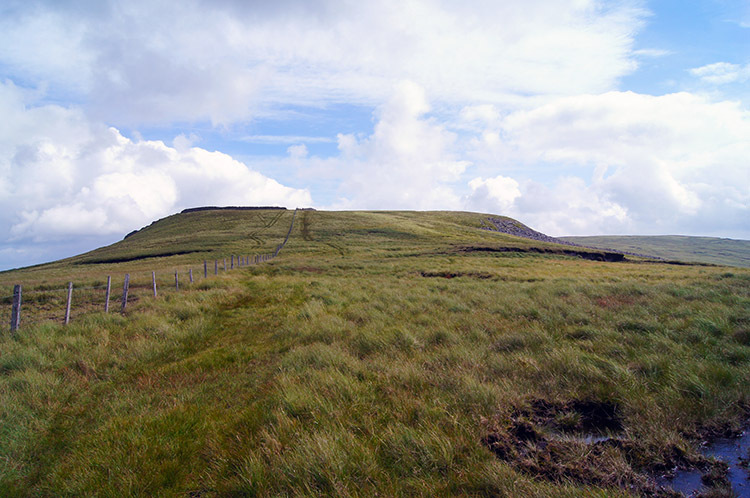 I designed the route to ascend the range by way of Leck Beck and Ease Gill and then return by descending the hill via the Three Men of Gragareth to Leck Fell House. Plans made, route determined, prints and GPS uploads done on the night before, John then picked me up from Harrogate at 6.20am and we made good time to arrive at Leck Church at 7.40am, twenty minutes ahead of our planned 8.00am start. We had planned the early start for the weather forecasters predicted a sunny morning with cloud building throughout the day and thunderstorms expected later. We so much wanted to avoid them and as the forecasters had promised John and I set off walking from the car park at Leck Church in lovely morning sunshine. 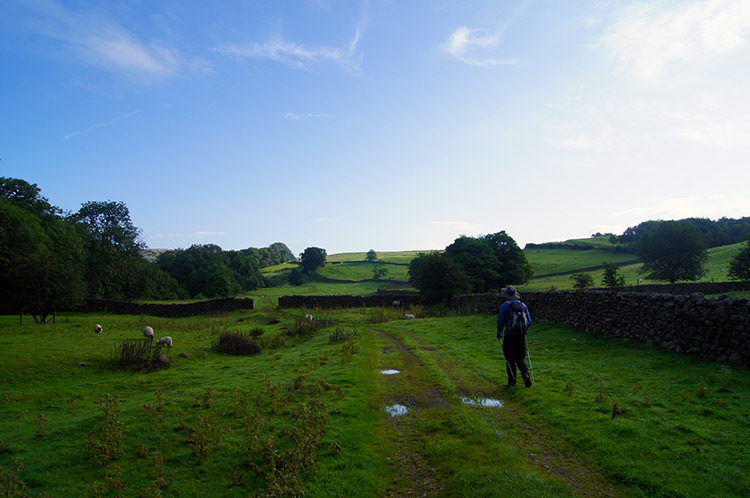 The first part of the walk took John and I from Leck Church, through the primary school grounds and along a very quiet narrow road with lovely houses on either side to Leck Mill where the road ended and became a track across field with Leck Beck to our right. Don't expect to see a working mill in Leck though, everything is domestic now about the houses by the road side. After two or three open fields the track took us into Springs Wood, a lovely small example of the gorgeous deciduous woodland which blesses the British countryside. As John and I walked through the wood the sun glinted through from the rising sun in the east to create a beautiful morning scene. As we gloried in the view we were amidst John and I listed to the babbling rush of water in Leck Beck making its way off the high ground to join the River Lune two miles further to the west. At one point in the woodland we followed a short length of track to a footbridge which gave us a good overhead view of Leck Beck on its course to the Lune before we returned to our true path towards the fells. Soon after re-emerging from Springs Wood into the light of the early day John and I left the last gated field and made our way onto the low moor. At first we followed a clear track for farm vehicles which ran parallel to Leck Beck for about 200 metres before it descended to the beck side. During this section of walking John and I were stopped in our tracks by a huge bird taking to the air directly in front of us. We had disturbed an adult Buzzard resting in the bracken nearby. I so wanted to capture a close up picture but the awe of watching the marvellous bird rise into the air and towards Fell End Crag on the far side of Leck Beck meant my camera stayed firmly put in its case. After the wonder of flight we continued to Arnside by leaving the edge of Leck Beck and making a short stiff 40 metre climb around a fenced young plantation before tracking on a course parallel to the beck. At this point the path became less obvious and I would say we followed sheep trods rather than a walkers path. Navigation was easy but finding the path was not. Few walk here and that is such a surprise. Why? Well my answer is that this appears to be an ignored gem of a walk. 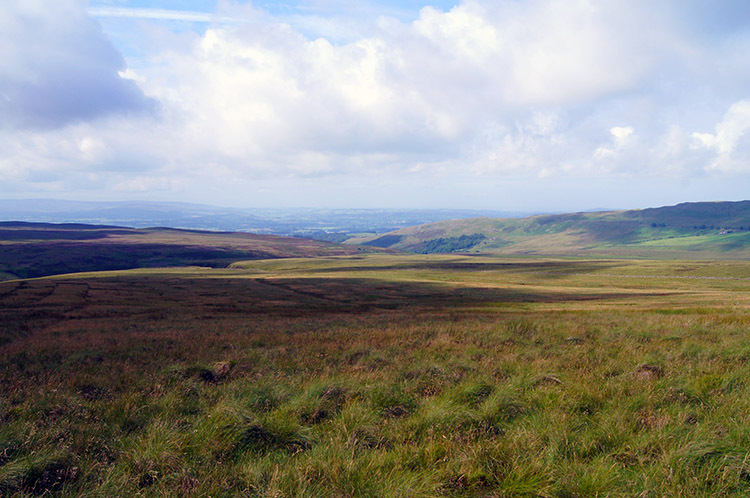 The views as we ascended onto the moor were remarkable, particularly those back to Leck and across the Lune valley towards Lancaster. And the views ahead of us to the high ground were also becoming very enticing with Leck Beck and its tributary of Ease Gill below us and the rounded high domes of Crag Hill drawing us on. To the left the Barbon Fells were also beguiling sights. What glory we were walking in. 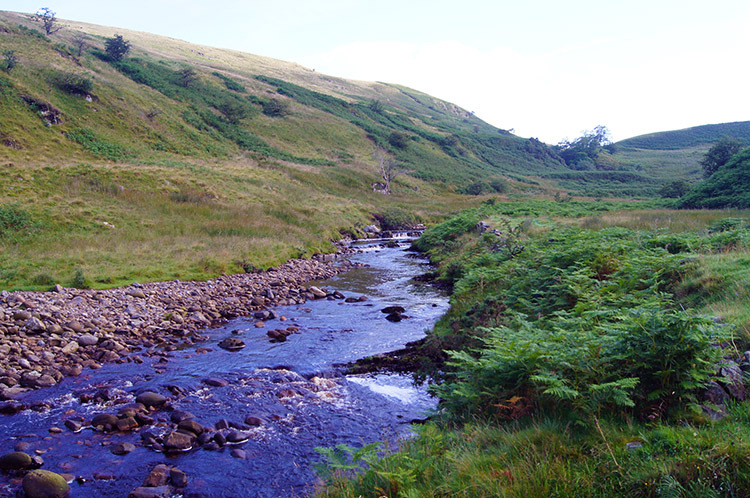 I have to say we should have returned to the waterside of Leck Beck and Ease Gill and discovered the true path but our contrived one of sheep trods and clearings was not that bad so long as we were careful not to put our feet into ankle turning holes. And with just being at sufficient height above the gill the views to it below were sublime while the views of the fells kept inspiring us on. We did not stay off course long, carefully angling our way down to a stile over a wall near Ease Gill Kirk. Once back by the waterside we rested for a drink, the day was hot and sunny and we re-hydrated. While taking our break John heard the sound of a waterfall nearby so after drinks we took time out to explore where the sound was coming from. I am so glad we did as we discovered Ease Gill Kirk, a small hidden waterfall which has a sheltered drop pool hidden below two short narrow cliffs. It was a brilliant find and anyone who should do this walk should seek it out. It is a tremendous highlight. Thrilled by our find John and I resumed our walk by doing the hard work; the climb up the fell to Crag Hill. We could have followed Ease Gill, my original intention but a path near Ease Gill Kirk and just after a bridge led us up a steep bank towards Bullpot Farm, a noted place for potholers as there is a rich seam of excellent pot holes in the area. John and I did not follow the track much beyond the steep section though, instead I plotted a direct line to Crag Hill and from there we made our way on a straight uphill course on good ground with the only slight inconvenience being us having to lift our feet a little more than normal to clear tussocky sections of the ascent walk. The going was a steady slog, always the niggling ascent but I tempered the work by taking short breaks to look around at the scene with the look back towards Arnside and Silverdale, Lancaster and the Morecambe Bay areas being abiding thrills. To my left and to the west Middleton Fell came into view, a dark black elephant of a fell which drew my attention and instantly adding itself to my list of 'must do'. The adventures of the eye drew me on. After two false tops to Crag Hill which slightly annoyed the true summit came into view, a flat top like a raised table. John and I made our way straight on and straight up to the summit trig point where we paused for a short while to take in the brilliant views all around. 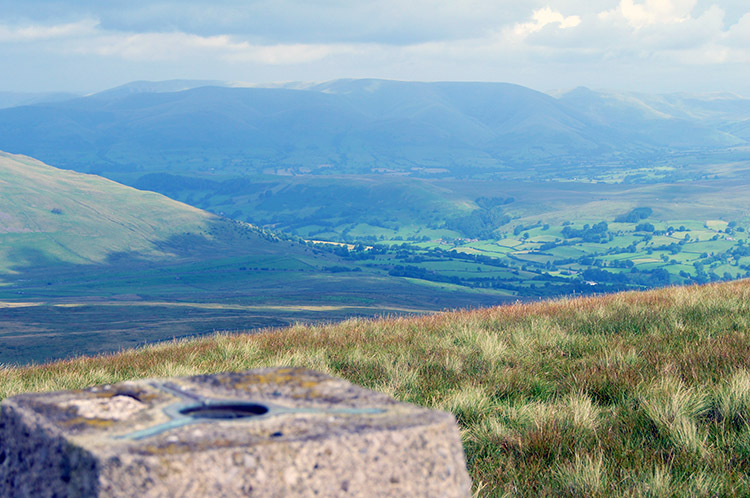 Like Alfred Wainwright who eulogised on some Lakeland mountain tops I could make a case for Crag Hill being one of the best vantage points in all of the Yorkshire Dales. Great views could be seen in every direction and looking round in a clockwise direction starting from directly north I could see the Howgill Fells, Baugh Fell, the Pennine Way track to Hawes in Wensleydale, The Three Peaks of Yorkshire, the Forest of Bowland, the plains of Lunedale, Morecambe Bay, Arnside and Silverdale, Barbon Fell, Middleton Fell and beyond them some of the higher peaks of Lakeland. It was amazing and had it not been for summer haze the blurry outlines of the more distant hills would have been clearer to define. Still, the sun was shining, the day was perfect for walking. And so we did, after the thrill of the Crag Hill panorama John and I carried on walking by following the track which was now discernible and alongside a wall towards Great Coum. 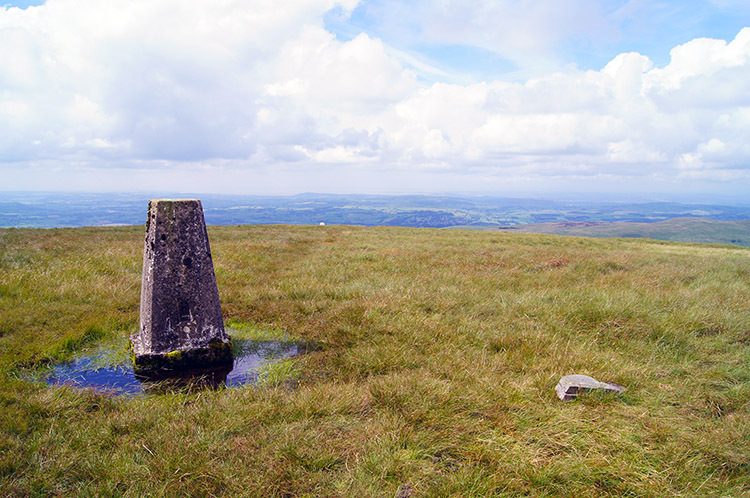 Great Coum has no trig point like Crag Hill and Gragareth. It has no real evidence of a summit and the views to the west and north are somewhat obscured by the tract of high land. 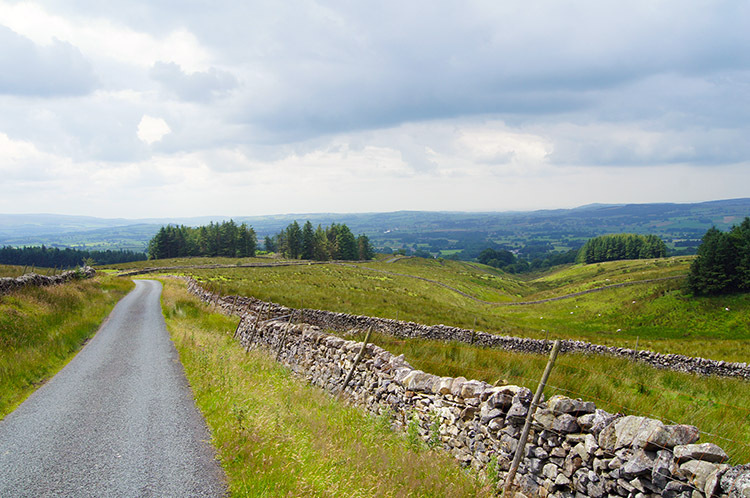 Therefore the attention is forced to the Yorkshire Dales in the east and south with Whernside and Ingleborough dominating and the long ridge from Gragareth forcing our attention as our next piece of ground to cover. Not before lunch though, we found a convenient shelter by good drystone wall and stopped for lunch. While we ate I looked over the ground and imagined the route. Clear as it is there is no path joining Great Coum and Gragareth, just open land. After lunch John and I made our direct course south towards Gragareth. At first the going was good and we passed some cairns and outcrops on good ground but by the time we reached Green Hill the ground was wetter. As we continued south from Green Hill to Millstone Hagg the ground was definitely wet and we were meandering around boggy areas to keep from sinking. The battle to keep out of water became more difficult and eventually the inevitable happened. I went down to my knees in water, splodging in and splodging out. On seeing my mishap John took a wider meander to avoid a similar sinking. 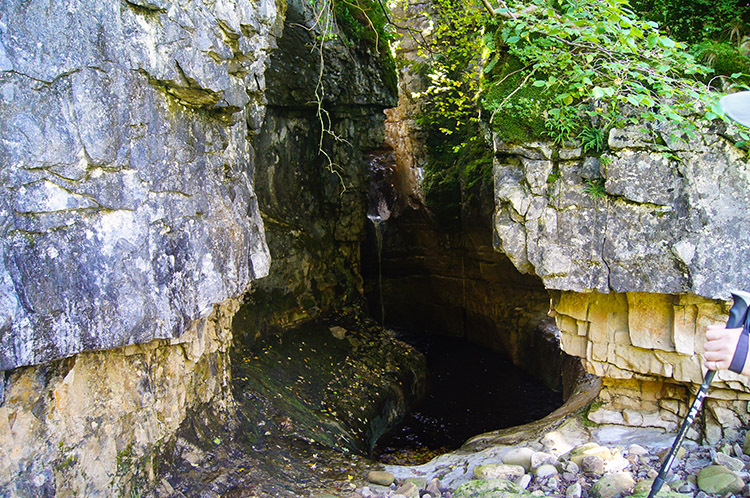 I took my plunge as fun; fun of the adventure and the discovery of a different route, the soggy one. I guess it is impossible to avoid the water completely and on parts some attempts have been made by walkers to create stone steps through the worse areas. As more and more walkers take this superb route more such bridges will be made. I hope so. Eventually John and I reached the summit of Gragareth and here the view was the reverse of Great Coum with east and south blocked while north and west were improved. Thus, Arnside and Silverdale and the Lune passage took the awesome precedent. 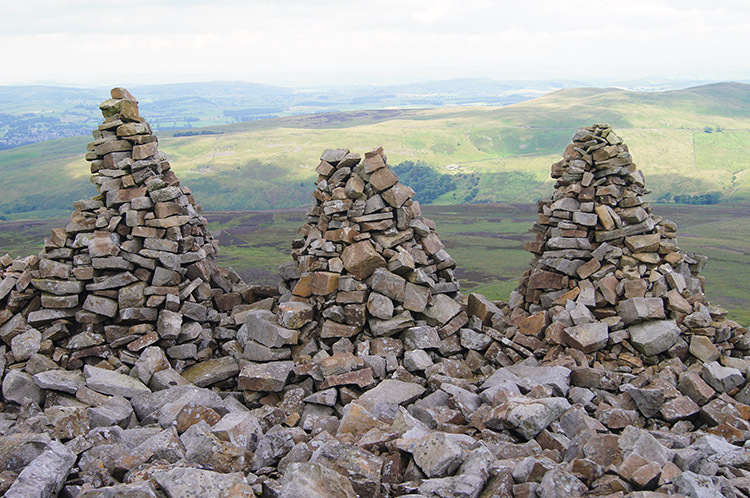 After revelling in the view once more John and I followed a path west to a series of cairns known as the Three Men of Gragareth which turned out to be exactly that, a series of cairns in triple peaks - the three men. From the cairns we continued down to the Leck Fell road and looked back to the marvellous mountain we had just walked. 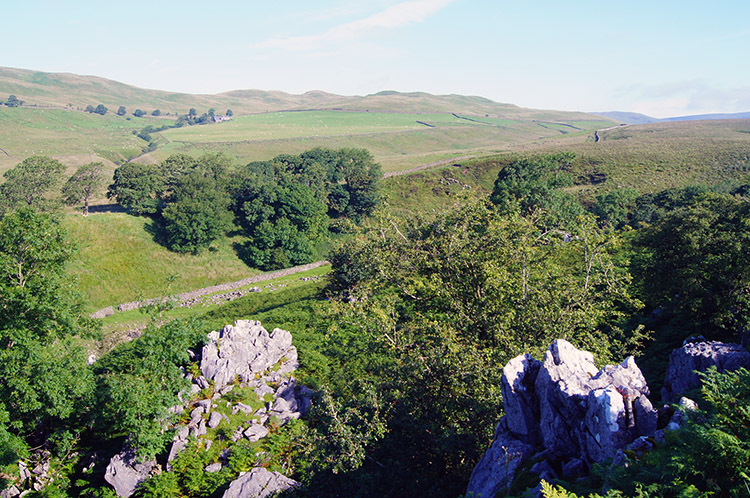 Then we followed the road back towards Leck on a lovely descent with opportunities to get close to more limestone outcrops and small deciduous copses. 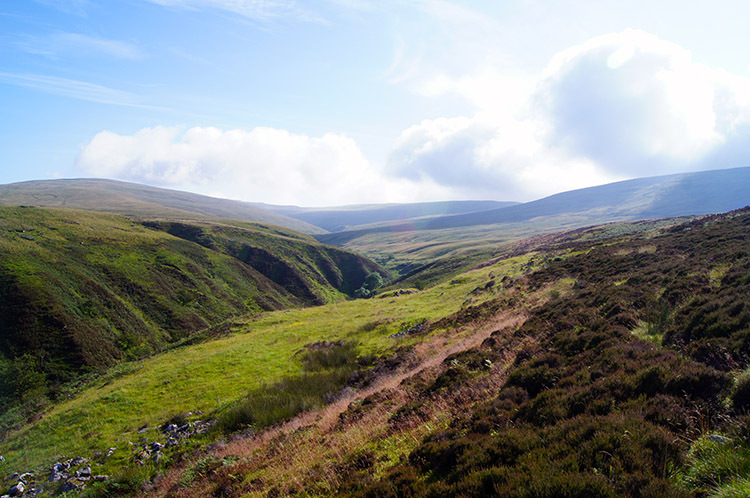 It was a lovely easy finale to a brilliant walk which should be enjoyed by all who like to explore, be at peace with the best countryside and moor which we are blessed with. 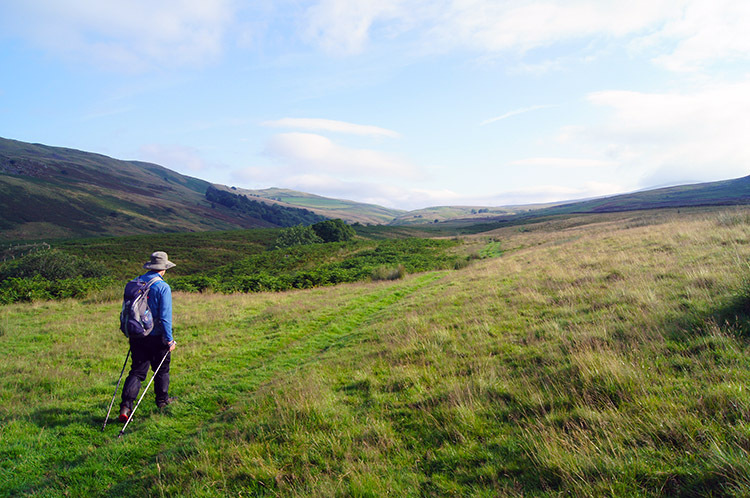 No doubt this walk is best in summer and a dry one at that but it is also one of those walks which must be done when the distant views are available. This is a walk of brilliant views.